Deposit & Cancellation Policy: Full amount due at time of reservation. Cancellation Policy: Cancel 45 days prior to arrival to receive a refund. Cancellations made less than 45 days prior to arrival are fully nonrefundable. Early departures or no shows will still be chargeable at their full rate. Note: Tents have a maximum double occupancy (2 adults). Children 12 and under may be added (with a rollaway bed request) to a Summit Tent for an additional $100 per night. Only 1 rollaway bed may be added to a Summit Tent. A child 6 or under may share the king bed with the parent(s) at no additional charge. Children 2 and under are free. All rates are subject to state and local taxes — All rates are subject to change without notice. Company Cancellation due to Inclement Weather: Cold or inclement weather will not permit cancellations and refunds unless the company deems the conditions make the stay unsafe. You acknowledge that Collective reserves the right to cancel your stay at any time, including once you are checked in, due to dangerous weather, or other conditions, solely at our discretion. In the unusual case of a company cancellation due to inclement weather cancellation, guest will be charged no more than first night's rate. Guarantee Policy: A non-refundable deposit equal to 100% of your total stay is required no later than 24 hours after your reservation is confirmed and will be charged to your Credit Card. If credit card payment is invalid, your reservation will be automatically be cancelled. Moonlight Basin Resort Fee: An obligatory Resort Fee will be charged upon check in. 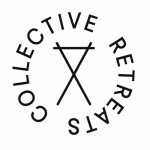 This fee allows Collective Retreats guests access to the Moonlight Basin Club, which includes the members-only Ulery’s Lake, outdoor pool and hot tub, fitness center, and hiking and biking trail network. The resort fee is a flat rate of $50/tent for 1-2 nights or $100/tent for 3 or more nights. Please review all Terms & Conditions. All guests will be required to sign a waiver at check in. Located on Lee's Pool in majestic Moonlight Basin, Collective Yellowstone is just nine miles from Big Sky, Montana. This breathtaking retreat is where luxury and nature collide. Each guest tent is uniquely outfitted with local decor and furnishings and feature plush king beds, outdoor private decks with Adirondack chairs, and private bathrooms. 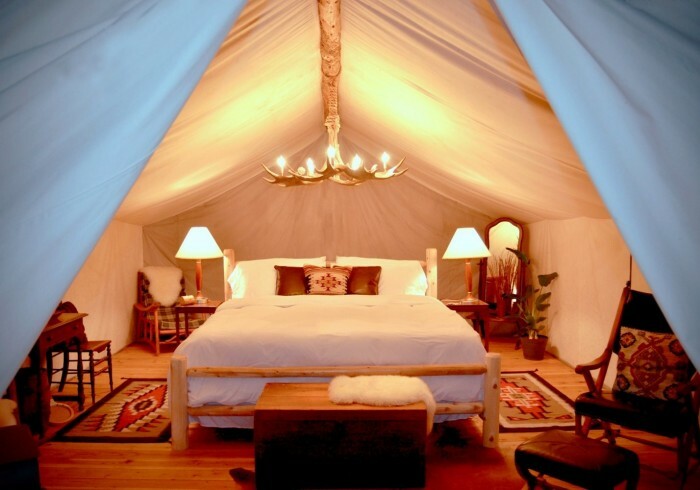 Each tent is situated lakeside, tucked into the Montana trees, and enjoys stunning views of Lee's Pool or Spanish Peaks. Your stay includes a complimentary breakfast, which is served at Three Peaks Dining Lodge and includes a mix of healthy and hearty options such as seasonal fruit, yogurt, omelettes, and plenty of fresh juice and coffee. We offer a variety of lunch and dinner options at additional cost, including a nightly farm-to-table dinner under the stars. Each evening, all guests are invited to join our sunset campfires with complimentary gourmet s’mores and beverages. We’re also happy to arrange private dinners or other custom experiences.